I have been attempting to not be so obsessed this year with pumpkin. I have been trying hard, but it seems to have backfired on me! Everywhere I go there is a pumpkin! Pumpkin latte, pumpkin creamer, pumpkin muffins. I even saw advertisements this week for pumpkin colored clothing for fall! With all the pumpkin influences, my mind just wouldn’t shut off. Of course, this means that I am in the kitchen today and I am jumping on the pumpkin wagon with both feet. 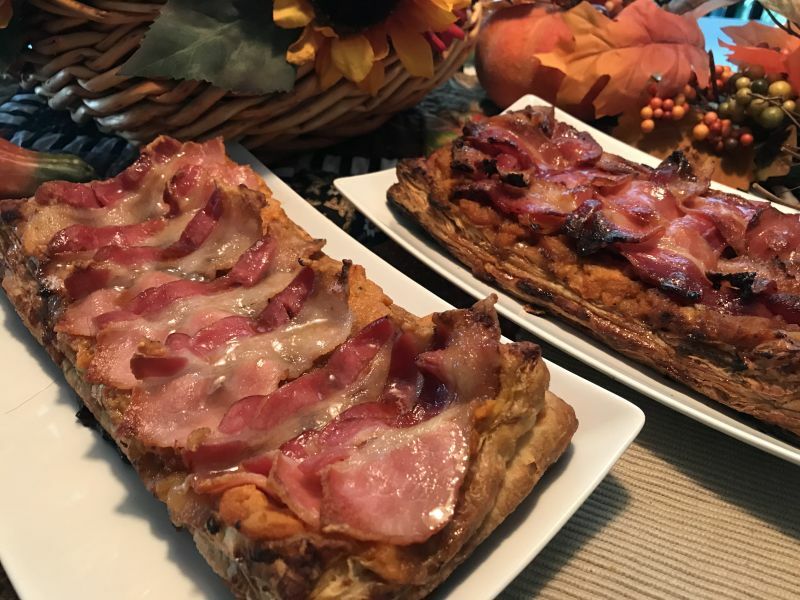 My house smells amazing right now, and I actually have a girlfriend coming over to taste the amazing pumpkin and smoked bacon tart I whipped up just for this week’s recipe! We love puff pastry! Its so flexible and can be used for savory or sweet dishes. If you have been following the blog for very long, you will already know that I have a love affair with puff pastry. I have made several tarts, in several different forms. It truly is an amazing product, and you can make gorgeous desserts as well as spectacular savory dishes with it. Today’s tart is not a dessert. It would make a beautiful breakfast treat, in fact, it would be a fine meal for lunch or dinner as well if you paired it with a small salad. 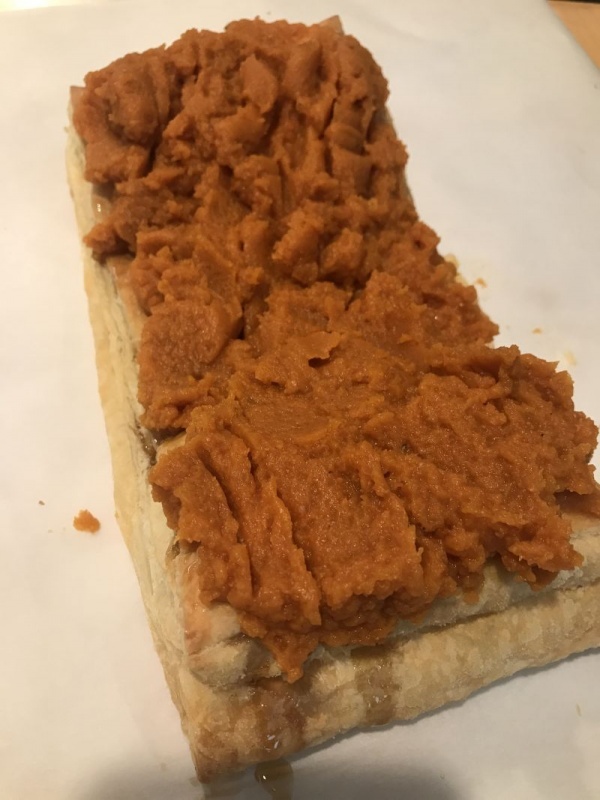 I whipped this up pretty quickly because I used prepared puff pastry and canned pumpkin puree. If you are determined to channel your inner Gordon Ramsey, you will want to roast your own pumpkin. 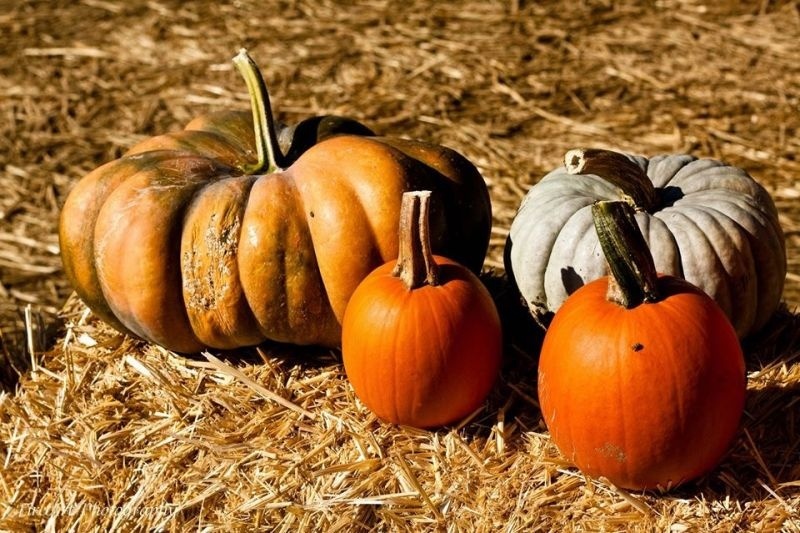 Roasting your own pumpkin adds an incredible depth to the flavor of the pumpkin, but it does take a little more work. To do this, clean the pumpkin and cut off the rind. Cut the flesh into cubes and toss with a little olive oil, then place in a roasting pan in a 350 oven until tender. Cool slightly and toss in the food processor and puree. You will need 2 cups of prepared puree for this recipe. I am certain this would work with a nice butternut squash as well, but I haven’t tried it yet. Believe me, after tasting this today, I will be making this throughout the holiday season. It is seriously amazing! Don’t forget parchment paper to make clean up a snap. 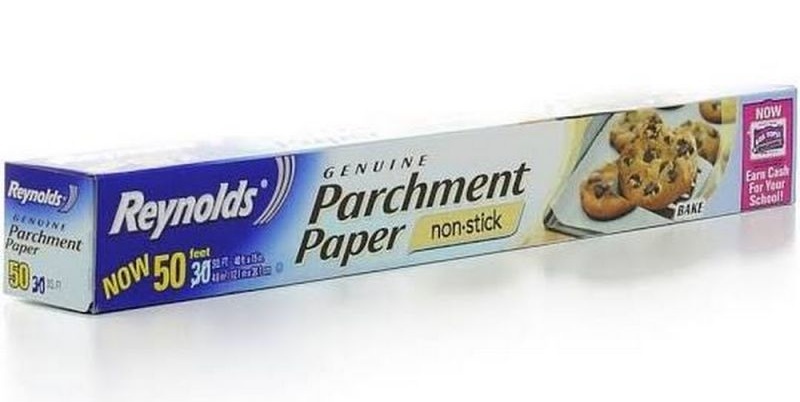 Since we seem to be making things with puff pastry a bit, I am going to remind you of parchment paper in the kitchen. I know I have mentioned it before, but it really is amazing when you are baking! You don’t have to use oil on your pan, and it also makes the baked item very easy to lift off of the cooking sheet. This particular recipe uses it, so if you don’t have it, run down and get a roll. Once you get used to using it, you are going to wonder what you ever did without it! 12 slices of smoked bacon. Leave 3 whole, and cut the other slices in half. 2. 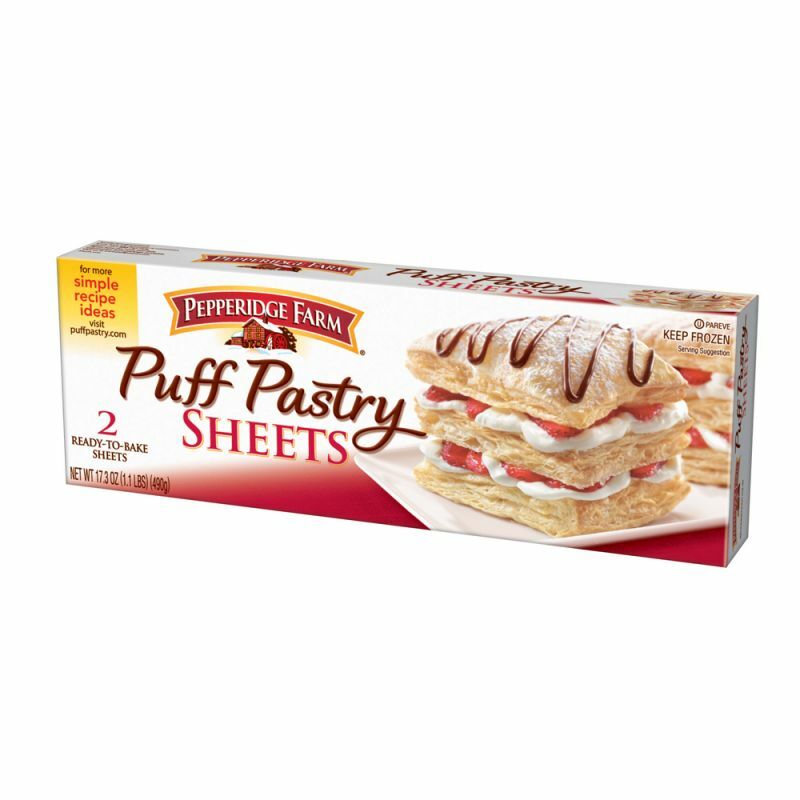 Unfold each sheet of the puffed pastry and cut in half across the longest side to make equal pieces. Do this to both pieces. 3. Lay one piece of puff pastry on the parchment, and brush with water. Lay the second piece of puffed pastry on top, to make a double layer. Repeat with the second sheet of pastry. 6. While the pastry is cooking, mix the pumpkin puree, nutmeg, brown sugar, maple extract, salt, and pepper together in a small bowl. When you pull the pastry out of the oven it will be quite tall and puffy. You will want to work quickly on the next steps and return the pastry to the oven as soon as you can. 7. Remove pastry from the oven and drizzle with maple syrup. Doesn’t the lattice work on this tart look pretty? If you have extra bacon, make them both this way, or just lay the strips across both. 9. 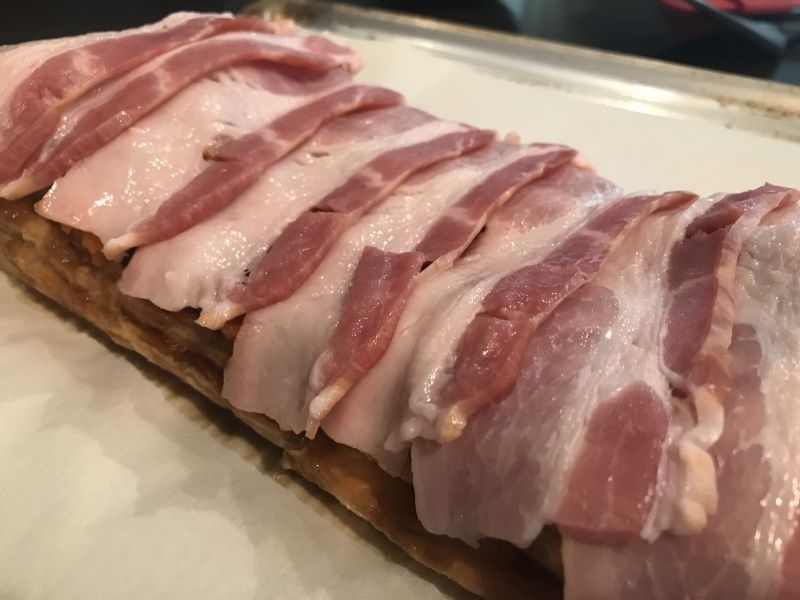 On one pastry, lay 3 slices of bacon lengthwise and then use 6 half slices to make a latticework top. Work quickly! This image shows the bacon laid in a line – it still looks and tastes delicious. 10. 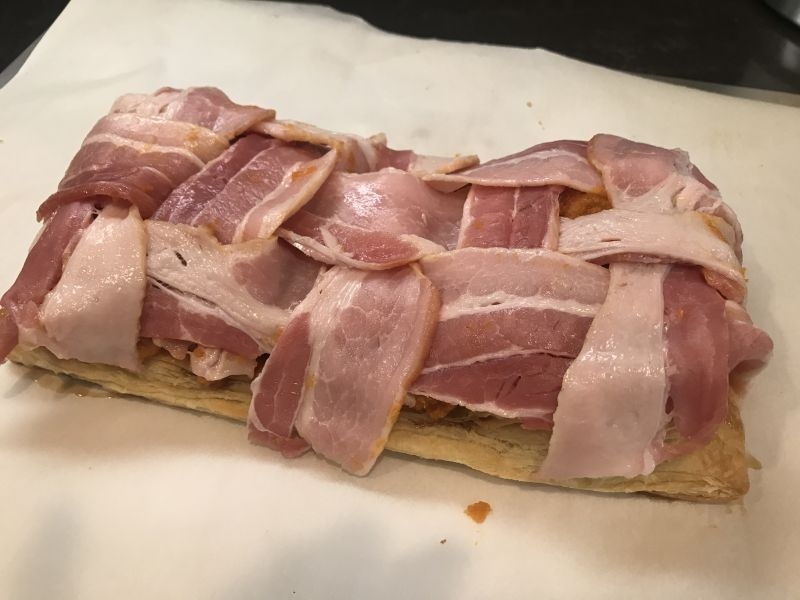 On the second pastry, lay the remaining 6 half slices of bacon across the top to cover. 11. 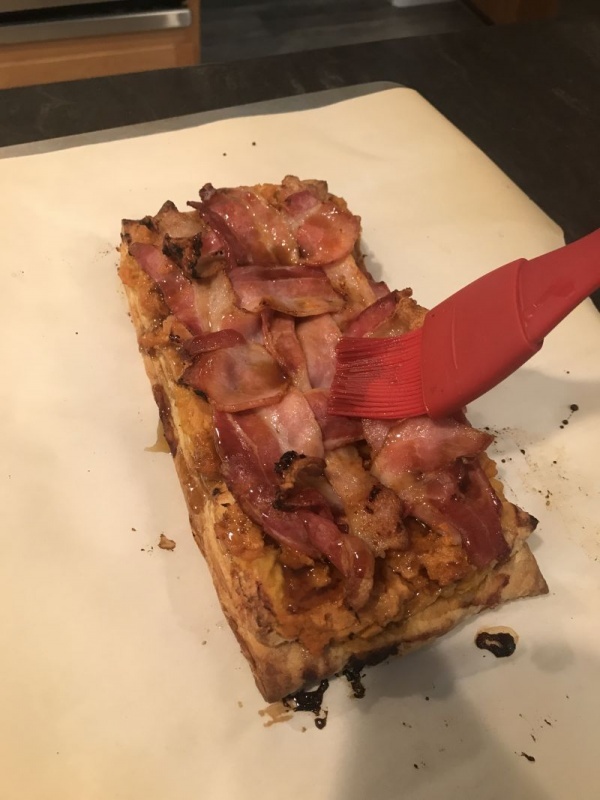 Drizzle with maple syrup and use a pastry brush to spread the syrup over the bacon. 12. Return to the oven and bake an additional 20 minutes, uncovered. 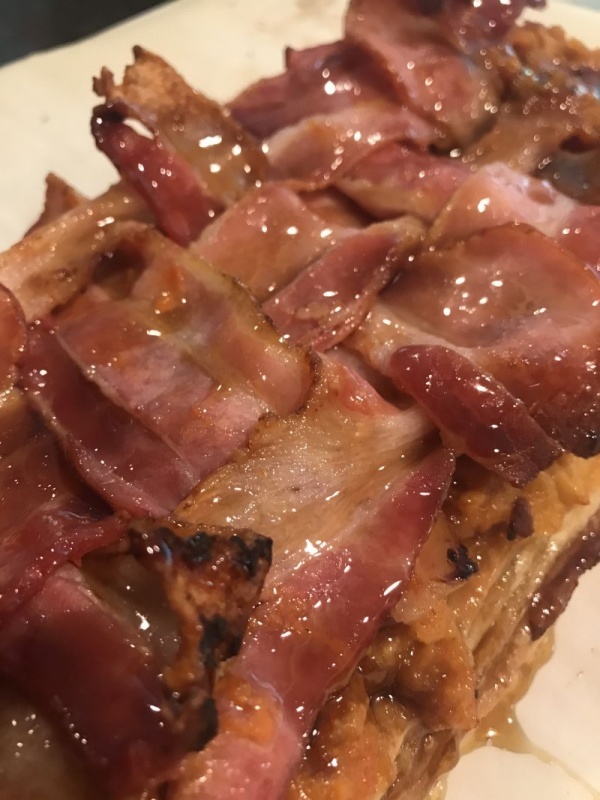 Look at that maple bacon goodness! 13. Remove from the oven, brush with more maple syrup and return to the oven for 5 minutes. 14. Allow to cool slightly, and cut in half or thirds to serve. It smells every bit as good as it looks and tastes. Delicious! I hope you enjoy this as much as we did! It was truly a delightful, sweet and savory dish that can be enjoyed for breakfast, lunch or dinner! Try it for breakfast with a side of sliced fruit, or for an evening meal alongside a nice salad. I know you are going to love this one! Amber comments: I had a few of my wine friends ask, ” But what would you pair with this dish?” It breaks a few of the rules of pairing as it has oppositive flavors. 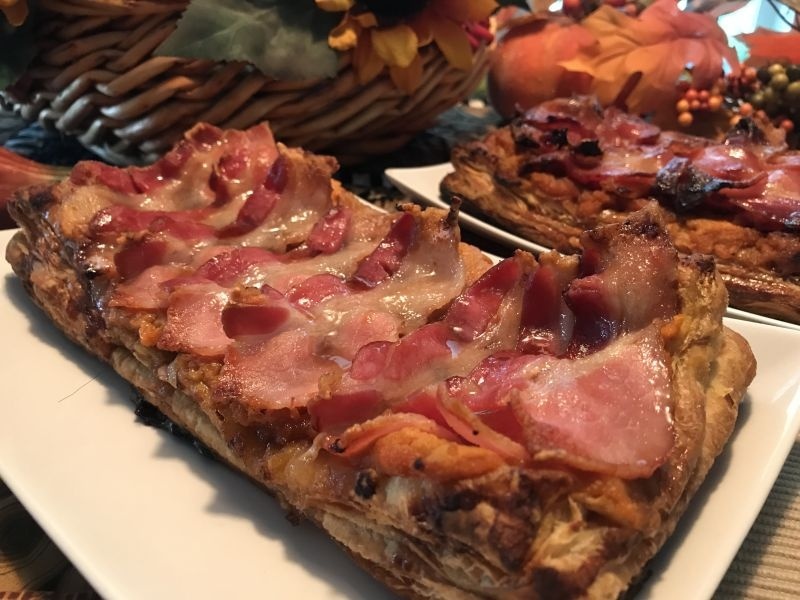 Do you pair with the pumpkin or the bacon? My answer is – reach for the Pinot Noir. Pinot Noir has a light body and layers of flavor such as cherry, cranberry, cinnamon, cloves, and can have smokey and spicy notes. It is a flexible wine and it pairs beautifully with anything you throw at it. I really like Artessa Pinot Noir. I have seen it for under $20 and its a go to when I am looking for a more medium body wine that will go with anything from my Thanksgiving turkey to my fanciest dish. If you love this quick and easy recipe, check out our recipe for Bacon and Nectarine Pizza. My goodness, a decadent delight. This looks amazing and so fall!